President-elect Donald Trump has big plans to save U.S. jobs. 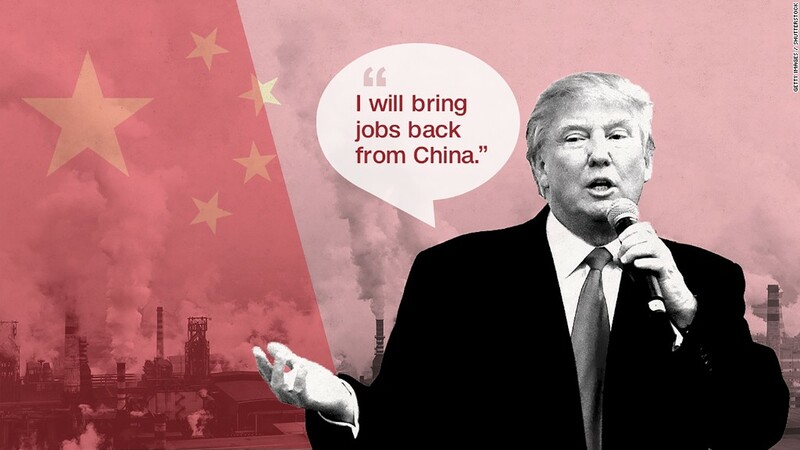 On Wednesday, Trump announced he is forming a new White House National Trade Council that has one goal: To stop the "exodus of jobs" to China, Mexico and other countries. The council is expected to "make American manufacturing great again." It's a tall order. The U.S. has lost 5 million manufacturing jobs since 2000. But Trump campaigned as a businessman who knows how to make global deals. Already, his tweets have pressured CEOs of companies like Boeing (BA) and Lockheed Martin (LMT) to respond. China could be his next target. Trump is tapping economist Peter Navarro to head up the new trade council. Like Trump, Navarro believes the Chinese do not play fairly on trade. "It's not trade that's the problem, it's the bad trade deals," Navarro said on the campaign trail where he served as a key Trump economic adviser. Navarro produced a documentary titled "Death by China" about how America lost its manufacturing base to the Chinese. He's also the author of "Crouching Tiger: What China's Militarism Means for the World." "Help defend America and protect your family: Don't buy Made in China," Navarro says in the film. Trump is putting Navarro in charge of a new "Buy America, Hire America" program that will impact everything from "infrastructure to national defense." How far will Trump go on China? Navarro and billionaire Wilbur Ross (now Trump's Commerce Secretary nominee) worked together on many of the economic policy details for Trump's campaign. In September, they called China the "biggest trade cheater in the world." "President Trump will use all available means to defend American workers and American manufacturing facilities from such cheating, including tariffs," Navarro and Ross wrote in September. One of the biggest questions for 2017 is how far will Trump go against China or any other nation on trade. Trump's appointment of Navarro and Ross to key trade posts in the new administration appears to signal a strong desire to stop importing so many goods from China. There are concerns from CEOs and economists that if Trump puts a big tariff on ALL goods coming from China to the U.S. (or Mexico to the U.S.), it will cause a trade war that will backfire and hurt American workers and consumers. Navarro says that's not correct. He told CNNMoney that tariffs are a "negotiating tool." "Those who suggest that Trump trade policies will ignite a trade war ignore the fact that we are already engaged in a trade war," Navarro wrote in September. Navarro has a PhD in economics from Harvard and is currently a business professor at University of California-Irvine. Other experts aren't so sure. They think it will be tough for Trump -- or anyone -- to get the U.S. growing much more than 2% and to balance the budget.